3rd Annual Conference of U.S.A.O.I. 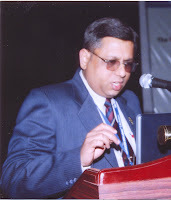 was held at Haridwar on 5th 76th April 2008, (Dr. R.S.Chauhan- Organizing Chairman , Dr. Jasprit Sing –Organizing Secretary, Dr. S.P.Singh- Treasurer), about 50 E.N.T. Surgeons attended the conference. Guest faculty was- Dr. A.K.Agarwal (Delhi), Dr. Naresh Panda (Chandigarh), Dr. J.C.Passey (Delhi), Dr. Sandeep Kumar (Delhi), Dr. Ombir Singh (Ghaziabad), Dr. Ravi Meher (Delhi), Dr. Saurabh Varshney (Dehradun), Dr. Pratima Gupta (Dehradun), Dr. D.M.Kala. (Dehradun). Scientific session included guest lectures on Facial nerve, anatomy of temporal bone, ossiculoplasty, mastoidectomy , national deafness programme etc, Panel discussions on – Advances in FESS, Pitfalls in mastoid surgery , Head neck oncosurgery. New executive committee was elected after General Body meeting.